^ 1.0 1.1 1.2 郝静. 气象援外提升受援国防灾减灾能力. 中国气象局门户网站. 北京. [2017-11-12]. （原始内容存档于2018-01-27） （中文（中国大陆）‎）. ^ News desk cast. MET office forecast rain for upper parts. GEO News. 2013-08-26 [2014-01-12]. （原始内容存档于2014-01-12）. ^ Jabri, Pervez. Met Office forecast cloudy weather, rain for different areas of Country. Business recorder, Jan 2014. 2014-01-04 [2014-01-12]. （原始内容存档于2014-01-12）. ^ 4.0 4.1 4.2 4.3 4.4 4.5 4.6 Staff editor, PMD. 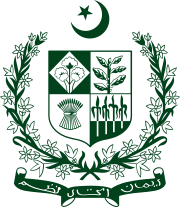 Introduction of the Pakistan Meteorological Department. Govt. of Pakistan. Pakistan Meteorological Department. [2014-01-12]. （原始内容存档于2014-01-14）. ^ Staff. Authorities of the Pakistan Met. Dept.. Govt. Pakistan. Authorities of the Pakistan Met. Dept. [2014-01-12]. （原始内容存档于2014-01-12）. ^ Gupta, edited by Uma Das. Science and modern India : an institutional history, c. 1784–1947. Delhi: Longman Pearson Education. 2010. ISBN 8131728188. （原始内容存档于2017-03-01）. ^ 7.0 7.1 7.2 7.3 Russell, Jesse. Pakistan Meteorological Department. N.A. : Booksviko publications. 2012: 140. ISBN 9785511582375. （原始内容存档于2018-01-27）. ^ staff. History of Suparco. Govt. Pakistan. SUPARCO. [2014-01-12]. （原始内容存档于2008-04-17）. ^ Staff. Geomagnetic Study. Govt. Pakistna. SUPARCO Geomagnetic program. [2014-01-12]. （原始内容存档于2014-01-12）. ^ 10.0 10.1 10.2 Staff. Met Observatories. Met Observatories. Met Observatories. [2014-01-12]. （原始内容存档于2014-01-12）. ^ Staff. Met office in Jinnah Terminal (PDF). Federal Aviation Authority. Federal Aviation Authority. [2014-01-12]. （原始内容 (PDF)存档于2014-01-12）. ^ 刘婧; 孟卓茹. 适应气候变化国际培训班学员在陕西培训学习. 中国气象局门户网站. 北京. [2017-11-12]. （原始内容存档于2018-01-27） （中文（中国大陆）‎）. ^ 王婷波; 蒋磊. 南南合作项目适应气候变化国际培训班在京开班. 中国气象局门户网站. 北京. [2017-11-12]. （原始内容存档于2018-01-27） （中文（中国大陆）‎）. ^ 中国地震台网中心. “中国援巴基斯坦地震监测台网”快速、准确测定兴都库什地震参数. 中国地震局门户网站. 北京. [2017-11-12]. （原始内容存档于2017-11-14） （中文（中国大陆）‎）.